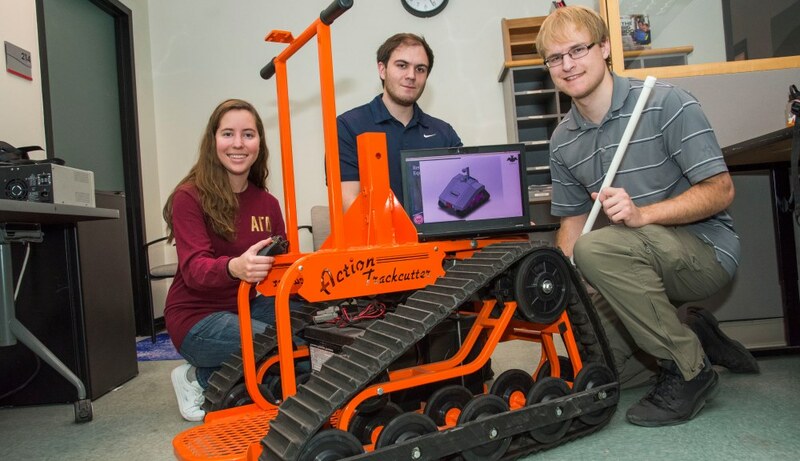 A team of undergraduates at Worcester Polytechnic Institute (WPI) has taken on a challenge to turn a wheelchair into an autonomous security robot that could help protect unmanned installations, like missile silos, for the United States Air Force. With just a tracked all-terrain wheelchair, or trackchair, and about $8,000 for supplies, the three students are building the proof-of-concept robot with the goal of demonstrating technology the Air Force one day could use to safeguard thousands of unmanned bases, such as missile silos, around the world. The military wants to have robots at these bases that can respond to and investigate intrusion alarms and other warnings within two minutes. The Air Force, which has been offering student-based, high-tech competitions for about 10 years, ran the autonomous security robot challenge for the first time in 2017, when three teams competed against each other. Each made advances, but ultimately ran into an obstacle they couldn’t overcome. No winner was named. This year, the WPI team was the only one to accept this particular challenge. While that removes the competitive aspect of the event, the Air Force is still looking forward to seeing what kinds of innovations the WPI students can develop, according to James Gilland, a research team manager at Ohio Aerospace Institute, which is running the challenge for the Air Force Research Laboratory. Equipped with off-the-shelf sensors, cameras, and video equipment, the robot must be able to unplug itself from a charging base station, then quickly and autonomously navigate to the spot where the intrusion was detected. Once at the site, the robot must be able to transmit photos and video of what’s happening there—whether it is an actual human intrusion or another issue, such as a tree down on a fence—to an Air Force base, where humans will decide if security guards need to be dispatched. To achieve these goals, the WPI team is building algorithms for autonomy, machine learning–based vision processing, and navigation, while also fabricating a sensor suite, a base charging station, and a communication network. The team has installed sensors and cameras, has set up a controller, and has been working on teleoperation controls. The students are expected to demonstrate their security robot this spring at Wright-Patterson Air Force Base near Dayton, Ohio. The WPI team taking on the challenge consists of seniors Marissa Bennett, who is pursuing a major in robotics engineering and a minor in computer science; Ken Quartuccio, a robotics engineering major; and Jeff Tolbert, who is double-majoring in robotics engineering and electrical and computer engineering. The students are participating in the challenge as their Major Qualifying Project, MQP, a team-based, professional-level design and research experience that all WPI undergraduates must complete. Kenneth Stafford, a teaching professor and director of the university’s Robotics Resource Center, and Alexander Wyglinski, an associate professor of electrical and computer engineering, are advisors for the project. Bennett said one of the challenges the team is facing is how to keep the robot moving at its top speed, given the added weight of the sensors and cameras and the extra power those componts will consume. The most significant challenge may be equipping the robot to work in a wide range of temperatures and environments. Gilland added he is hopeful the WPI team will find innovative ways to make the robot see, sense its surroundings, maneuver, and guide itself. He’s even eager to see how they will make sure the robot simply does not tip over in difficult terrain. “The part that will be useful for us is to see which algorithms work better than what the Air Force has been working on,” he said. Action Trackchair Inc., a Minnesota-based company that builds all-terrain mobility chairs, provided a trackchair for the students to use in the challenge. 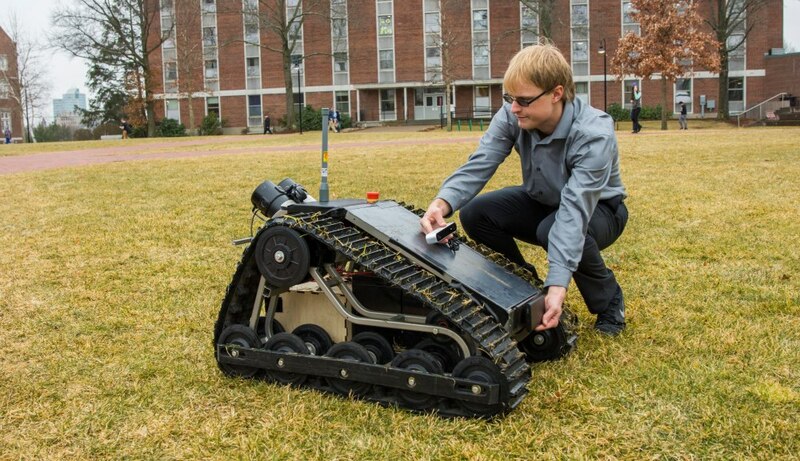 The device is designed to move over dirt, grass, and snow, as well as through water.